9/30/2011Share this story on Facebook! Jaylene Clark performs in her self-written and directed play, "Renaissance in the Belly of a Killer Whale." 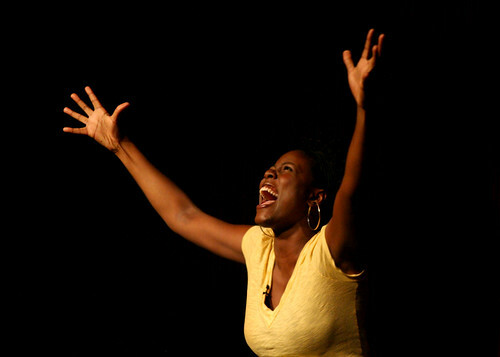 Jaylene is just one in a long line of IC grads who have gone on to work on and off Broadway. Learn more about IC's acting program. It has been a little over a year since I graduated from IC with a B.F.A. in acting and a minor in writing. Since then I have been blessed with the opportunity to professionally combine the two things I spent the most time doing while at school: acting and poetry. It was my time there that prepared me for the opportunity to produce my own off Broadway play, Renaissance in the Belly of a Killer Whale. It started with a random Facebook post: “It’s time to stop dipping a toe in here/ Wading in a little bit there/ I need to jump back into this SeaWorld of poetry like I’m Shamu/ Heavy/ Too much gentrification going on in Harlem to get light/ Time to spit killer lines, with killer rhymes, of killer tales, ’cause Harlem is looking more and more like the belly of a killer whale.” A few days later, Alfred Preisser, my former teacher at Harlem School of the Arts, asked me to create a poetry-infused play about Harlem gentrification based on my killer whale post for his play-reading series. I assembled my team of three close friends, and the rest is history. Renaissance is a play written and produced by Hollis Heath, Janelle Heatley, Chyann Sapp, and myself. Also producing are Alfred Preisser and Roy Arias Studios. I am the director, and I also act in the play, as do Hollis and Janelle. While in IC’s acting program, I gained valuable skills and techniques, experienced the thrill of performing in professional productions, and expanded my theater network. But academics don’t tell the whole story. Ithaca College provides its students with the amazing opportunity to create their own campus organizations, and when I arrived there in 2006, eager to dive into the college poetry world, I discovered that IC did not have a poetry organization. Similar to my Renaissance experience, I assembled my team and created something I could call my own, and thus Spit That! was born. Spit That! taught me what it means to organize and lead weekly meetings, which is a skill I use every day with my team. When organizing our annual poetry showcases, I coordinated rehearsals, gave directorial notes, and did various other tasks that I find myself doing with Renaissance. Thanks to this great preparation and the fabulous cast and team, Renaissance has really had a chance to shine. Our show premiered as a play reading at Harlem’s historic Schomburg Center for Research in Black Culture, a research unit of the New York Public Library, and went on to sell out four performances at the Times Square Arts Center. The play then had a limited run through August for a total of 15 shows. Being onstage in Times Square and performing in a play about my beloved Harlem that I wrote, produced, and directed was the definition of God painting his love on my life. Every night, the audience was bubbling with praise for this piece, which was such an honor for me personally. We have a college tour for the 2011–12 school year set. It is only fitting that IC was the first stop! It was there that I got my first taste of creating and organizing something I can call my own, and this taste has now become a hunger that I will continually strive to satisfy. My niece who recently graduated from IC and went to school with Jaylene told me about the play and I went to see it with my niece and sister. I too was raised in Harlem and truly appreciated it! What a talented group!